The morning sky was still dark, and Zach stood at the foot of my bed, dressed in his crisp new baseball pants, shirt, socks, and hat… staring at me. With one eye open, and still as under-the-covers as I could get away with, I leaned out to thread his belt through the loops. I sent him merrily back to his room to give me five more minutes of quiet before we’d have to start racing through the house, collecting every camera we have, and hoisting the boys into the car, all so we could make it to the parade staging area for the pre-dawn (not really) call time. Though still reeling from the heartbreaking news from across the globe, and like many a U.S. city this weekend, our town continued on with baseball Opening Day for the kiddos. I found a log to perch myself on along the parade route, and tried to wish a large coffee into existence. But then, it was here! The parade was here! At the front were, I’m guessing very important local dignitaries in satin jackets being chauffeured in classic cars, waving at me. Yep, me. When it’s a little parade, you don’t have the comforting shroud of anonymity, and they are in fact waving directly at you. Awkward or not, you have to wave back. Finally the teams started coming by. The teenagers looked tired, the kids Jake’s age looked at their shoes, working hard not to make eye contact or wave at their parents. The kids in Zach’s age division were yelling and cheering and high-fiving anybody they could get their hands on. When Zach’s team finally walked by, he was yelling “Let’s go Yankees!” and “yeaaahhhh!” In the very brief time I had a visual on the team, John, in his coach shirt, had to gently redirect one little Yankee out of the crowd and back to his group four times. John caught my eye and I could tell it had been a very long little parade. Zach had been counting down to this day for the last three years….the day that he would finally take the field as a real-life baseball player. Up to this point, he’d sat wide-eyed in the bleachers, dressed head to toe in his brother’s team colors, glove in his lap, bat at the ready, and often sporting a batting helmet…yes, sitting in the stands wearing his batting helmet, on the off-chance he was suddenly going to be called up. Unlike the other little brothers, he didn’t run off to the playground, beg to go home or whine about being bored. He did ask for snacks every 5-10 minutes, but there he sat, cheering for Jacob and his teammates and befriending the other parents and fans. This weekend after he proudly donned his own uniform, he tracked down those parents he’d shared the stands with to show them just how far he’d come. “I’m on the Yankees now. I’m # 8. We played the A’s, and it was a tie. It was my first game ever, and I had my first team snacks ever, Oreos and a cheesestick, and also a water.” Then he’d turn around so they could see he had his name on his jersey. Have you ever watched 5-year-olds play a game of baseball? There are about 10 adults on the field, most tasked with keeping the kids standing up, facing the right direction, and in the case of opening day, off of the bounce house. The coach pitches, or perhaps more accurately, throws the ball at the bat that’s roughly the same size as the batter. The second the ball is hit, every kid in the field, which sometimes includes the base runners, heads for it. Sometimes there’s tackling, sometimes crying. This day, Zach played third where he dutifully stood, foot on the bag, glove in the air, ready to make the out. As it turns out, 5-year-olds don’t throw to third to make the out. Jake’s team played a couple of hours later, where by comparison, it looked like the actual Cardinals were playing the actual Rangers. For the three months leading up to opening day, Zach would ask me if I could bring music to the field – a soundtrack for his debut. You see, we play that fun car game where you pick out what song you would like to hear if you got the chance for an at-bat in the majors; and that other fun car game, where you play “Uprising” by Muse (which next to AC/DC’s “Back in Black” is the world’s greatest batting/walk-up song) and then in your best stadium announcer voice, introduce the Giants batters one at a time, “Noooooow batting…..Cody Ross!,” and then the next person says “Nooooooow batting…Pablo Sandoval!” You know…that game. So naturally, Zach assumed, he would also be entitled to tunes that would make him hit a grand slam and get his devoted fans on their feet. I’d say, “Zach, I wish I could buddy, but I can’t bring music to your game, as awesome as that would be.” But there on Opening Day, at Zach’s first game…was a DJ. Sure, the guy was most likely assigned to provide a soundtrack for all the festivities – the kids punching each other in the bounce houses, or having their faces painted with fairy wings and fake scars. But along with his first baseball snacks and first baseball parade, Zach got his walk-up music for his first official at-bat. I don’t even think he cared that it was Lynyrd Skynyrd. First off… Yay for opening season and little boys in uniforms. 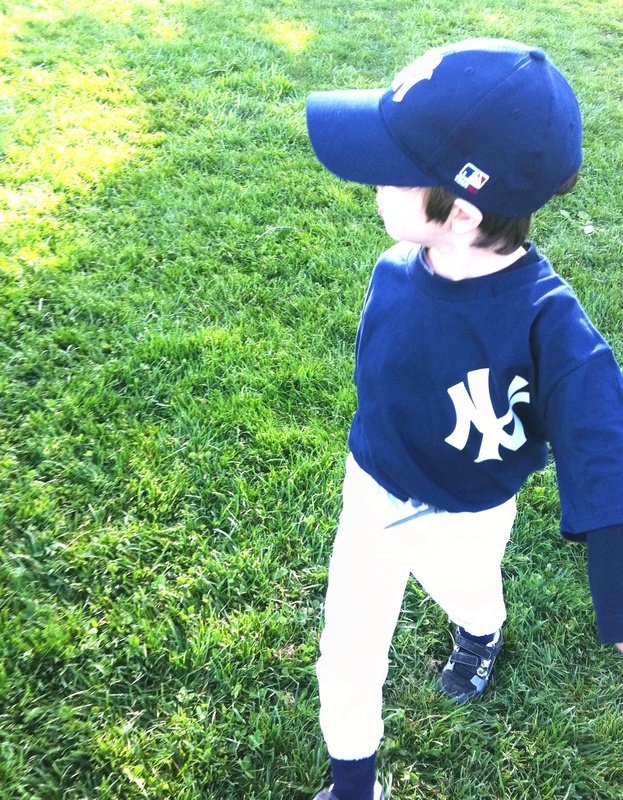 I can’t go to those games and not get teary eyed–even though my child resisted all forms of team sports. Second, why can’t Zach have a soundtrack? Really? I just don’t see the harm of you pulling a John Cusack a la Say Anything with your own boombox for good measure. What are they going to do? BAN YOU? I doubt it. You’re too damn cute, for starters. Third… as for lightness and heavy news. Paying attention to the beauty in your world is a lovely way to honor the horror that has been the past week. Um – that is the best visual, I love it. I will do that and think of you! Should I use the same song? Will it make him hit a grand slam? thank you for your sweet note – it means a lot 🙂 you rock. Once again…I am laughing and shedding a little tear at the same time! Hurray for Zach and his “at bat” song. If it was “sweet home alabama”, you seriously couldn’t go wrong! I hope the boys, Coach John, and Mom all have a great season!! haha! Yes, it was Sweet Home Alabama! And I think they played it about five times 😉 Thanks as always for reading & thanks so much for your sweet note! Have you arrived safe & sound? I’ll have to send a pic of the boys in their uniforms! Cheers!